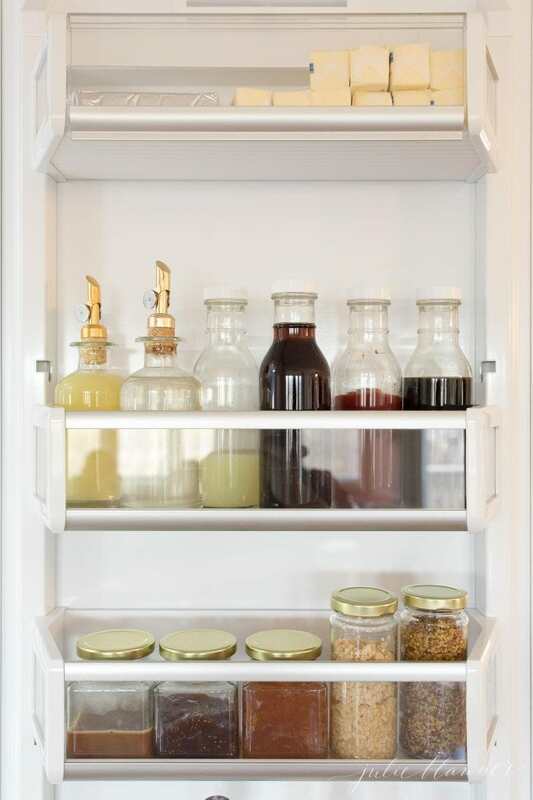 Refrigerator Organization tips and tricks to maximize space and function. 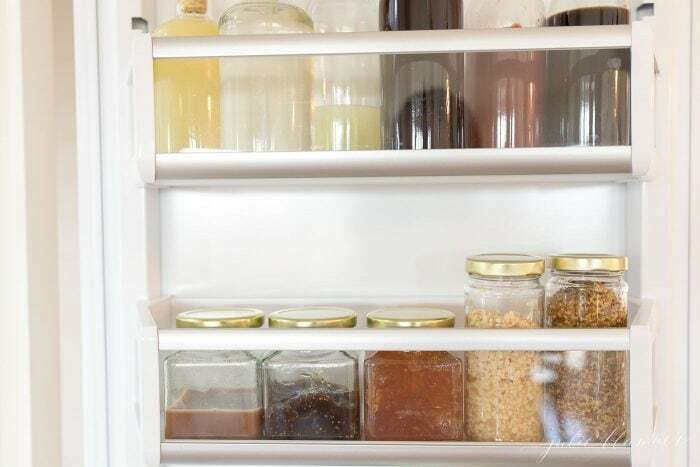 Get unique refrigerator storage ideas and the best fridge organization containers to keep food fresh while maintaining a clean refrigerator. This is one I have thought long and hard about. 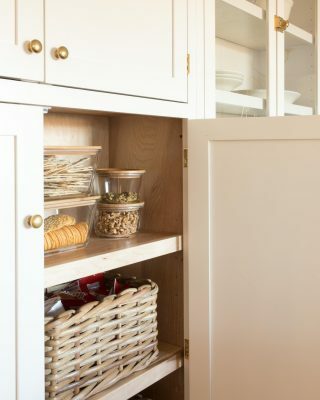 It didn’t come to me near as easily as our other kitchen organization projects including under the kitchen sink, the kitchen cabinets or pantry (both coming soon). 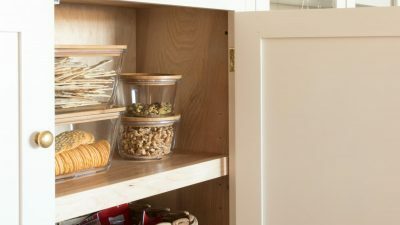 I think it’s because I felt so compelled that it should be pretty or functional, I worried that I would have to buy an abundance of jars and containers to repackage everything and in the process, lose function and ease. As I worked through the process, I realized I was over-complicating it. 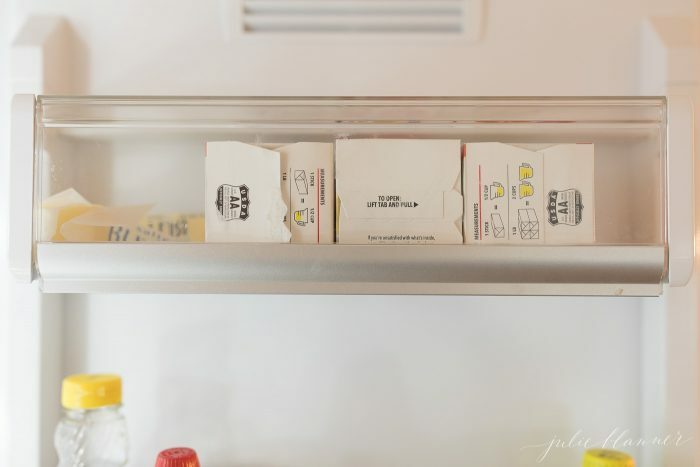 Even if you’re not ready to go all in, there are simple things you can do to make your refrigerator more functional for you. But first, a full disclosure. 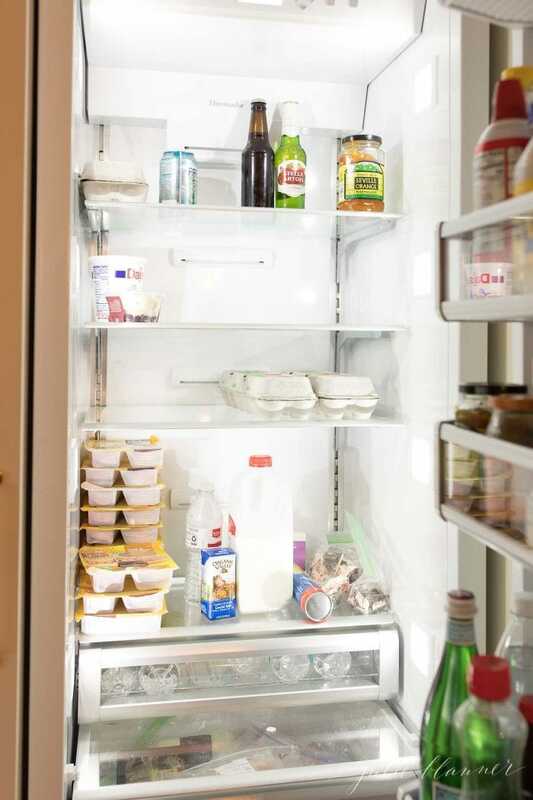 Opening your refrigerator to the world makes you feel a bit, well, vulnerable. I photographed the before photos the day before school returned from break and had stocked up on lunchables. I decided not to include them for fear of being ridiculed for serving them to my kiddos (not a proud mom moment), but also fear I’ll be ridiculed for having a bare shelf. Please know I, too am just doing my best to simplify life and find solutions that work for our family and am sharing to provide ideas and inspiration. Fortunately, a week in to this project, I can say I’m back to preparing lunches and loving our refrigerator organization! I also took this as an opportunity to eliminate some rarely used processed stuff that accumulated over the holidays or that we don’t really use ie: store bought caramel sauce, whipped cream and parmesan that I normally make from scratch and freshly shred. 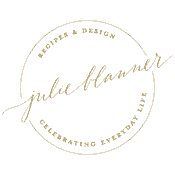 Let’s face it, the holidays turn everything upside down which is why it feels so great to take the month of January to get organized. If you haven’t yet, I hope you join my challenge to get organized in 30 days! Get organized in 30 days! Determining what’s not working/problem areas will help you find functional solutions. Let’s get started, shall we? 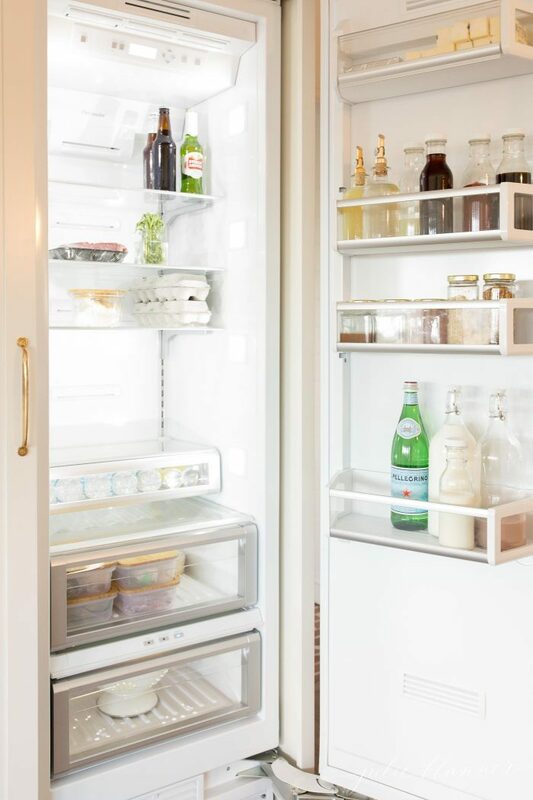 Start by removing everything from your refrigerator. This should take less than 5 minutes, don’t overthink it. If it is expired or if you don’t use it, remove it. 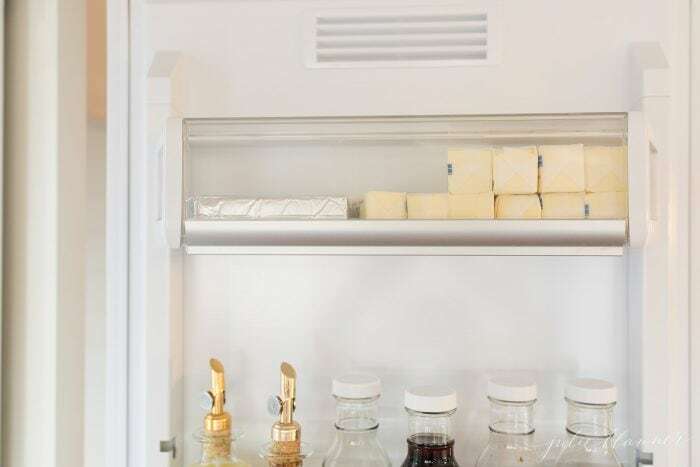 Doing so, you’ll likely eliminate a large part of your refrigerator. I was shocked at how much stuff we used for a single recipe and don’t intend to use again and the number of expired items in our refrigerator. Wipe it down. I know, I know, not fun at all, but when your fridge gleams, you will, too! 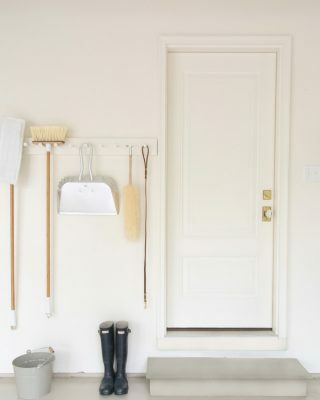 One of the greatest perks of organizing is starting with a clean slate! Adjust your shelf height to fit your new design. Consider what should go back in in it’s current container and what would be better transferred into a new vessel. I decided jam fits perfectly and stands out more in a consistent container. The same for milk, cream, lemon and lime juice. I just write the expiration date on the bottle with a permanent marker (which comes off when you wash it). 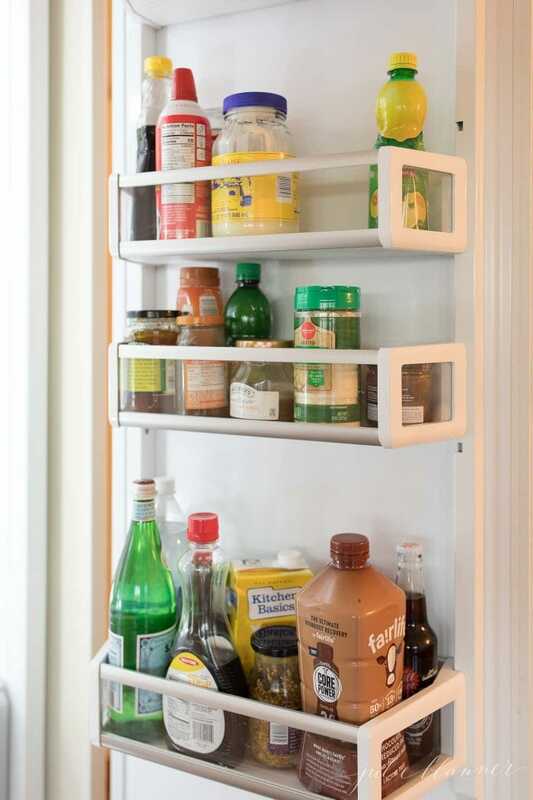 Immediately remove items from excess packaging when you walk in from the grocery store. For example, individually wrapped items no longer need their outer packaging. This is particularly true with butter and sour cream. 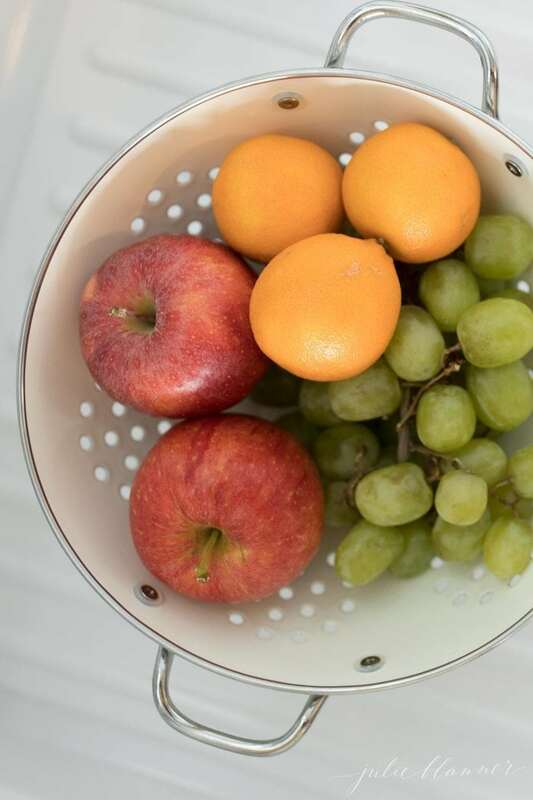 Place all fruits in a strainer, rinse and place them in the fruit drawer. 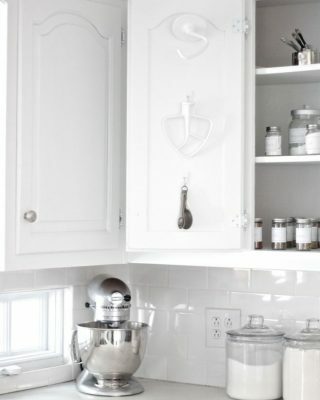 This will prevent bits and vines from entering the fruit drawer which isn’t nearly as easy or accessible to clean. We placed deli meats in individual fridge organization containers in hopes of not allowing them to expire prior to consuming. Fresh herbs can go in an open jar or small vase. It’s okay to keep packaging. You’ll notice that I don’t find egg cartons offensive and feel it’s easier to keep eggs in their cartons. 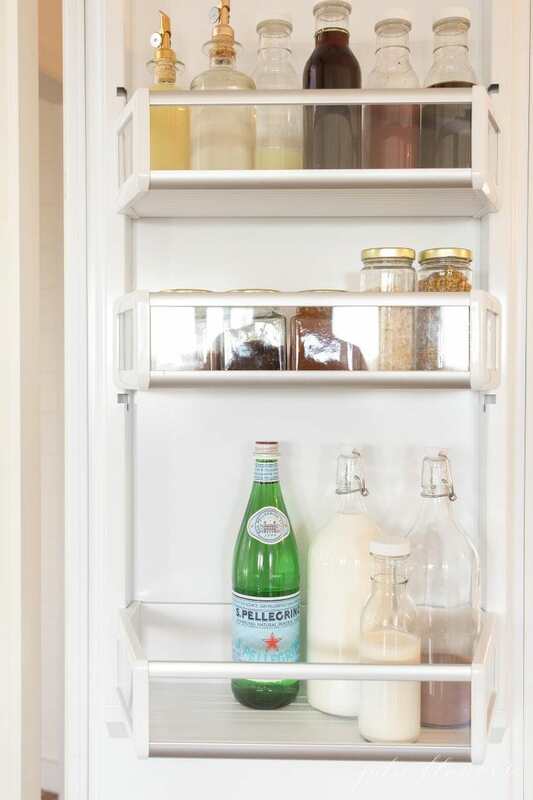 When we renovated our kitchen, we opted for a smaller refrigerator. 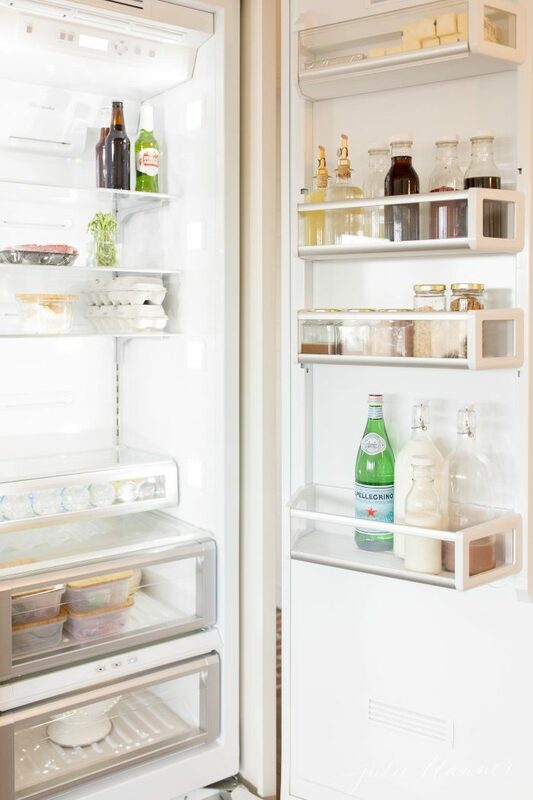 We truly don’t need that much refrigerator storage if we keep it cohesive so we can easily assess what we do and don’t need prior to running to the grocery store. Make it work for you – I like to keep small bottles of water accessible for the girls to pack their lunches. Only use storage bins as needed. 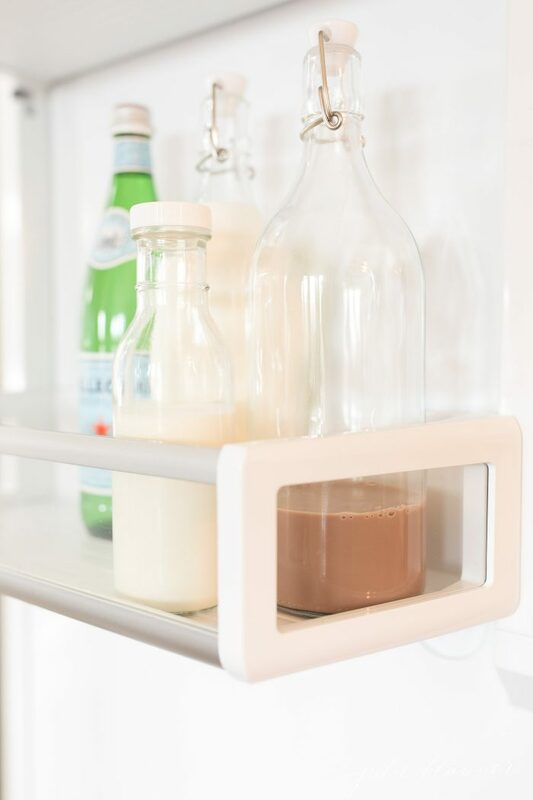 This is very personal and exclusive to your refrigerator design and your lifestyle but I’ll share how and why we organized ours. I like to put drinks on top with the girls bottle water in a lower drawer that is easily accessible for them. 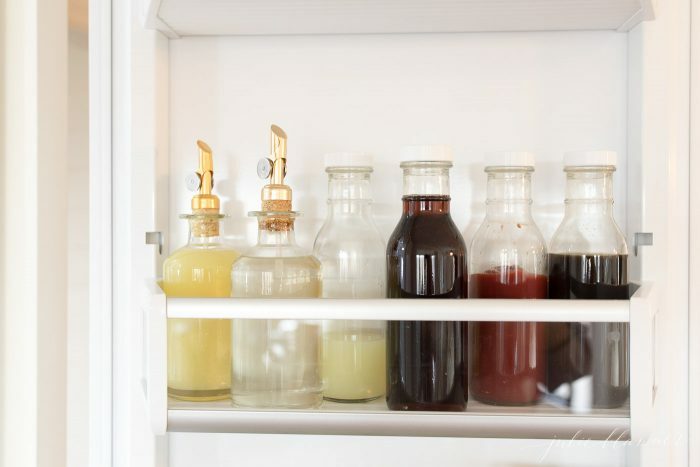 If you use these refrigerator organization ideas, I’d love to see! Tag me on Instagram! 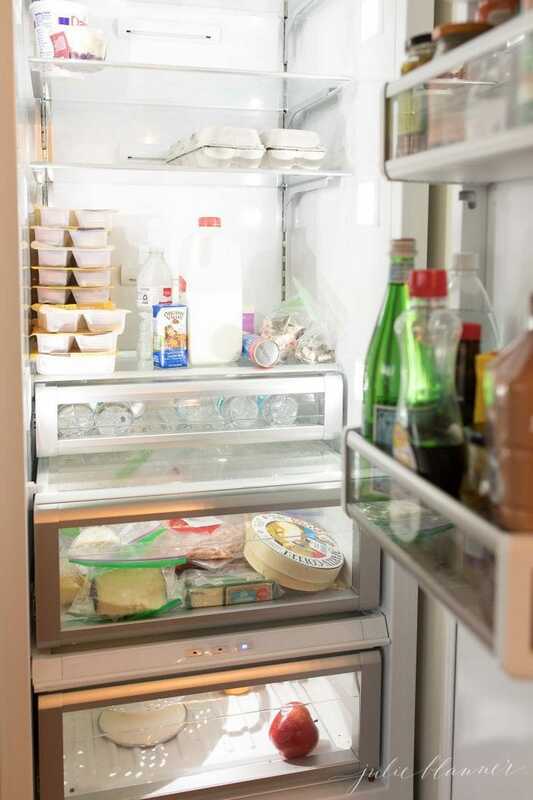 You can see our more of our organized refrigerator in the YouTube video below. Don’t forget to click subscribe! 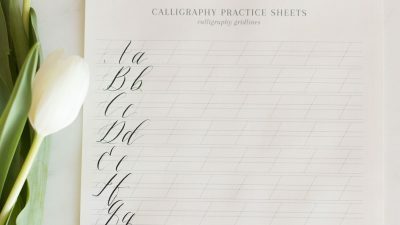 I recently discovered your blog and I love it! I am on fire to organize lately, so I’m really happy to find others who are, too. The beautiful photos of your home are inspiring. Please keep it up! I wanted to say, too, that if someone comes to your blog and ridicules you for anything, just remember that they are the problem, not you! You’re too kind, Diane, thank you! I have so much more to share with you! Hope you enjoy it! I was cleaning out my fridge when I took a break to look at my emails and there you were with tips on organizing my fridge. I love your after-photos! The bamboo lidded containers are very nice! Wish me luck! Thanks for the inspiration. I was cleaning out my fridge when I took a break to look at my emails and there you were with tips on organizing my fridge. I love your after-photos! The bamboo topped containers are very nice! Wish me luck! Thanks for the inspiration. Thank you, Maureen! Good luck! 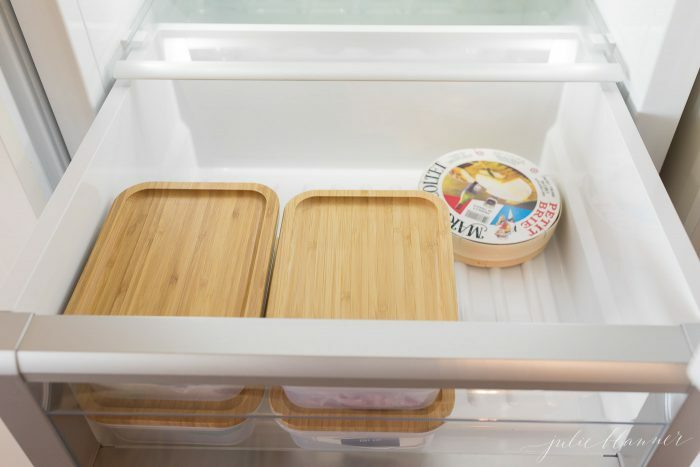 Could you tell me where the rectangular bamboo lidded storage organizers you used to store lunch meat came from? I’ve gone through your post several times and can’t find a link! 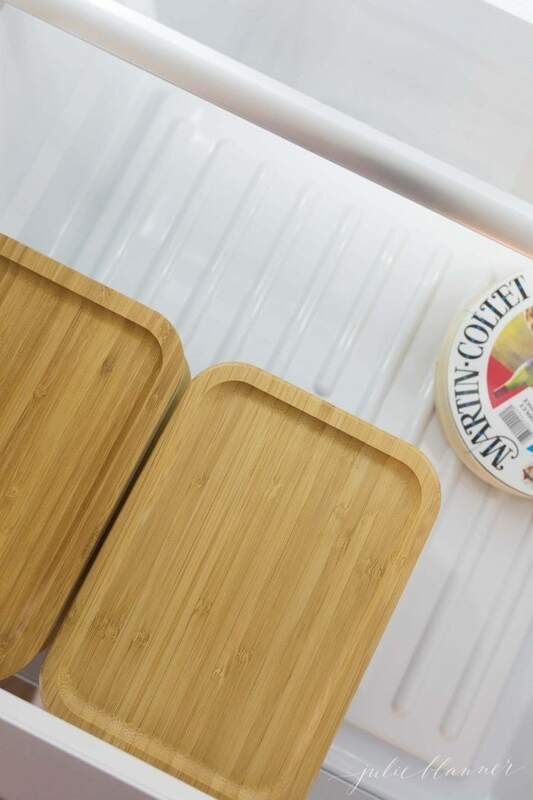 Those look great for food storage! Thank you for your help and great ideas! Oops! I had so much information to share I completely forgot to mention my favorite part! I had family scour an IKEA for those…they don’t offer them at ours. I linked to them on Amazon as well. Enjoy! Raise your hand if you have lunchables in your fridge. You’re hilarious! Ready to be disappointed? We had a meat & cheese drawer where they choose ham or salami and the cheese of their choice. They can choose anything out of the fruit and veggie drawer which for my kids is a clementine, apple, grapes, blueberries or carrots and then one snack out of the cabinet and their water. 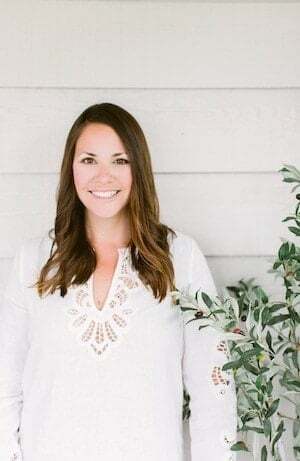 My friend Leah of Freutcake shares lots of great lunch ideas – I just don’t have the headspace so I set it up so they can make their own and make the bus! Since you are a fellow decanter, try buying your kids attractive water bottles and teach them to fill them up. It’ll save room in the fridge and be a good lesson in environmental stewardship. My kids love: yogurt, peanut butter and bananas rolled up in tortillas, string cheese, and soup (doesn’t have to be homemade, let them pick their favorites at the store). Hope that helps keep the ball rolling through the long months ahead! YES! This is on the top of my list for 2019. For the longest time I wouldn’t let them use plastic bottles and we’ve become all too guilty of it for sake of ease. I used to think “we recycle” but am becoming increasingly aware that we consume and very little of what goes into the recycling bin is purchased and truly recycled. I want bananas rolled up in tortillas! We do a lot of string cheese and yogurt, too. Thanks, Katie! Wow! Great job! I love all your containers too.